As those in the baby boomer generation steadily move toward retirement age, they have started thinking about where they plan to spend the remaining years of their lives. While some may have needs that require the care offered in a nursing home or assisted living facility, others will prefer to stay in their homes. 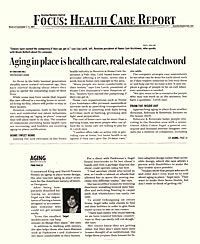 Houston companies, both in the health care and residential real estate industries, are embracing an "aging in place" concept that will allow them to do this. The number of companies providing home health care are increasing, and builders are receiving aging-in-place certification. As published in the Houston Business Journal on September 3, 2004. Click here to read the full article.